I have started two drafts to try and break the lull in my posting, one is an attempt to provide a round up of events over the last month or so, the second is a brief account of our wedding weekend; but as I reread them I just can’t seem to find the words to finish them, thinking that the subjects within could either do with there own post or indeed need to be posted at all. Thankfully, having read and commented on a few blogs as I try and catch up, the solution has been provided by Pete of Beetley; I should be catching up with my composting toilet diary, the poor neglected subject that is so close to my heart! As the proud owner of no less than three composting toilets, yes that’s right, three; I have a certain duty to perform on a regular basis, details of which I have posted on several previous occasions. This weekly event has remained much the same despite the increase in receptacles, I just happen to be emptying more buckets as we have guests and volunteers; that is until the wedding! Seventy odd guests and only one toilet in action at the time, you may imagine that things got messy and people were off put by the whole idea; but with a last minute printed banner announcing the wooded area to be the G E N T S (thank you Dorrota) a ready supply of saw dust, a upgraded 40 litre container, anti bacterial hand gel and a bunch of flowers in a vase; well I don’t think anybody noticed the rudimentary facilities. Of course as the master of more than one ceremony that day the duty of emptying was most definitely mine, but I was pleasantly surprised that I only had to carry out the procedure three times’; a simple affair with the aid of the mini tractor and with the queue burgeoning to no more than four people whilst they waited for me to refresh the outhouse, I was able to keep all the wee in one place . And for those of you who may think the tractor was a bit over the top, believe me 40 litres of wee logged sawdust is heavy! So what has any of this got to do with going thermophilic? In fact what is thermophilic? Thermophilic is the stage that a humanure pile or indeed a compost pile goes through as it’s temperature rises above 44°C (111 °F in old money) The microorganisms get very active and can raise the temperature as high as 70°C (158 °F), although such high temperatures happen very rarely according to the Humanure Handbook. This is when the pile kills off all the nasty things that may linger in the pile from your pile, although if you are a relatively healthy person it probably has less things to kill. The higher the temperature the quicker it kills pathogenic microorganisms, viruses and bacteria. Some sources say that 30 minutes at temperatures between 55 and 60°C will kill anything bad within the hour. So when I discovered, with my newly acquired soil thermometer, that my compost had reached a temperature of 57°C following the addition of a wedding parties converted alcohol and soft drinks, not to mention the food scraps and other so called waste products; I knew at long last that I had gone thermophilic 🙂 Of course I may well have reached this stage many times before, but not having a handy thermometer to hand I never knew; even if I was aware of the steam rising as I pulled back the cover material and watched the heat rise as I made the latest deposit. An old photo, this pile is now full to the brim and closed off with straw bales at the front; left to cool and mature for a year before adding to the soil to grow…well who knows, I’ll let you know next year. Eddy the friends of yours who regularly write like BeetelyPete must be worth their weight in something precious to you. He especially makes me laugh, I hope he reads this thank-you compliment from me. Good luck with spreading good example around. Sorry for the delay in replying, lots going on at the moment. All the best and happy composting! btw. have U maybe happen to owe or have access to this book http://goo.gl/wcazJx. I’d love to to plod throu it but somehow I can not find spare 10 $ in my epocket. byw. My compost pile faces massive invasion of eathworms. I must have got cooled by the ambient temps but remian much warmer than ground and thus all of the wiggly creatures decided to immigrate and thrive in it. Congratulations to you both! Where are the pictures? Hmmm . . . I wanna “like”, but . . . Anyway, congratulations on the wedding. You can’t destroy water, and while I have great faith in humanity’s ability to wipe themselves out, I’m pretty sure the land will still be around afterwards. My only hope is they hold off for just another 30 years, give or take 10 years or so. Besides, my greater worry is Yellowstone (or any of the other super volcanoes) blowing up, or an asteroid hitting Earth, or even a new strain of the flu wiping out a third of the population. Nice idea Pete, but the only Guinness around here is the black stuff; much needed when iron is required for the pile! Who knew? Learning so much here! Thanks! The Humanure Handbook by Joseph Jenkins is all you need: http://humanurehandbook.com/ You can even view the book online for free! You’ve topped me too. 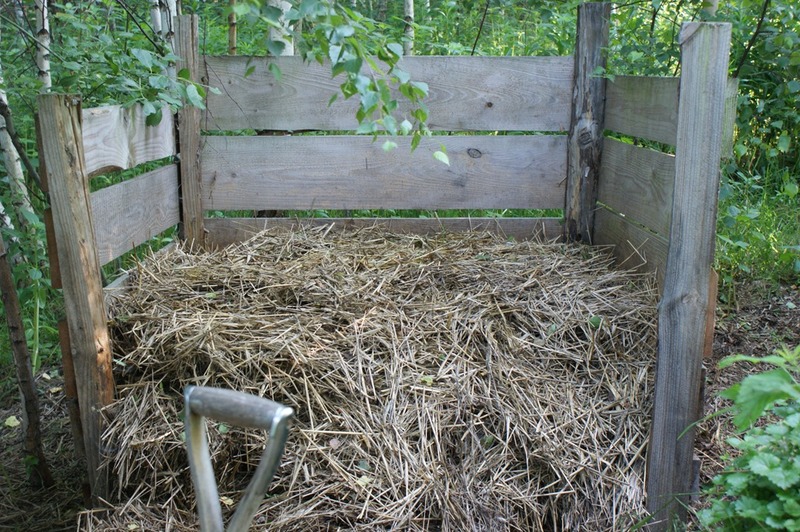 We only have one compost toilet and emptying the buckets every week or so is just right for me. As for the liquid, I’ll certainly vouch for the weight, which is one reason why I choose to ‘water a tree’ whenever possible. As the autumn sets in the inside toilet is the favoured place to go, the trees will have to do without the extra nitrogen! In fact I starting to think that the extra pee may have been the thing that was required to get the temperatures rising as high as they did. I’m keeping a close eye on the new pile to see how it heats up. You have well and truly topped me Eddy. I can honestly say, that despite having had three weddings, I never left any of them to tractor off a pile of pee-soaked sawdust! Has to be a first mate, I should contact Guinness if I were you, must be one for the record books. I wish I could get as excited about being ‘thermophilic’ (sounds like a disease…) as you are, but I really can’t, so will just have to be very pleased for you instead. I think I will just go and flush my toilet now, just because I can. Regards to you, Mrs Winko, and all in Poland. Pete. Previous Previous post: Streaming or running?